A perfect graht-oak pod home, grown by a Home Singer from the very roots of Elden Root—compact, comfortable, and convenient to everything. Praise Z'en! 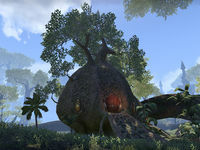 Snugpod is a small player house in southern Elden Root. It consists of one room and has no external courtyard. To purchase this house with Gold, you need to complete Reliquary Retriever achievement and Room to Spare. 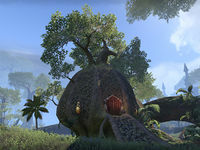 This house replaced Clenegor's Hut in Update 12.